Welcome, you have landed on the Your FIRST page of the Silverlight Financial website. Feel free to look around our entire website while you are here. We have lots of valuable information that we think you will find useful. You FIRST – Federal Employee Retirement Guide - is an outstanding and thorough resource for past and present Federal employees. A clear-cut guide through the maze of Federal income benefits. No unnecessary jargon, just plain English. 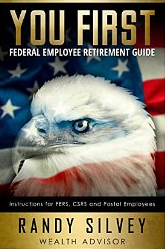 An informative guide through Federal Employees Retirement System (FERS), Civilian Service Retirement System (CSRS) and Postal Employee benefits including – Thrift Savings Plan (TSP), Government Pension(s), qualification guidelines for a “bridge” annuity and Social Security Administration (SSA) Retirement benefits (some CSRS employees may not qualify). Veteran Wealth Advisor (and past Federal employee), Randy Silvey, reveals exceptional insight and knowledge, that his 13 years’ experience assisting Federal employees, has afforded him. · When is it really ok for me to retire? · How to financially prepare for retirement? · What steps should I take when I’m ready to retire? · Will I qualify for the federal government retirement pension? · What is the bridge annuity? Do I qualify to use it? Should I use it? · When should you start taking Social Security Retirement benefits?